Not many shops take the time to offer a comprehensive range of replacement parts. We do, because we care. 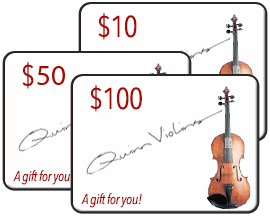 Sooner or later, you'll need one of these items, and you will be reminded why Quinn Violins is always your first choice! 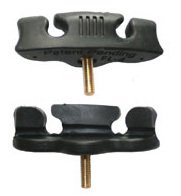 The short and long are the two sizes that come with a shoulder rest. The Long fork goes on the E/A string side of the rest. The Extra Long fork is optional for those who need extra height. The Extra Long fork is placed on the high side, and the standard long fork is moved to the back side of the rest, raising that side as well. This part holds the end bracket to the main pad component. 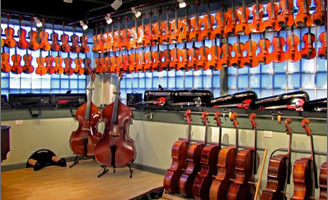 This part receives the fork member, and there are many different types for each specific model of shoulder rest. Some models have a low and a high side. The high side is on the E/A string side of the rest. This part receives the fork member, and there are many different types for each specific model of shoulder rest. Each rest comes standard with one short, and one long fork. The long fork goes on the E/A string side of the rest. For all models of Bonmusica rest. Available for most models. For smaller Violin rests, you can cut down the material to fit. For all models of Resonans rest. Set of 4 pieces. 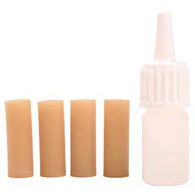 Set of 4 pieces, with a special lubricant for easy installation. For all models of Wolf rests. Pair or two for all models of Wolf rest. 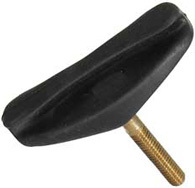 Replacement Forks for Mach One rests. Each rest comes with one short and one long. The long fork goes on the E/A string side of the rest. Self adhesive, unless otherwise noted. 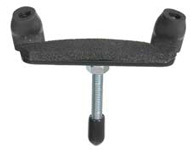 These shoulder rests come standard with one short, and one long. Extra long forks are optional, for more height. This is the part that holds the pad to the instrument. For all models of Playonair rest. These shoulder rests come with two standard forks. The extra tall one is optional, for more height.